The voiceover configuration in these rooms consists of a studio microphone system, Avalon preamp, and Apogee Duet sound card/audio interface which are connected to a rack-mounted Apple Computer (Mac Mini). Step 1) Press the power button firmly on the black media rack to turn on the computer. Note: If you find the computer already powered on, it is highly recommended that you restart the computer to ensure that all settings return to their default (and properly working) state. 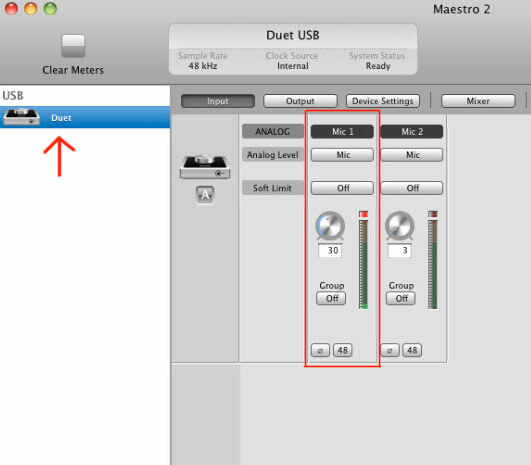 Step 2) When the computer has turned on, make sure the Apogee Maestro software is open the and Duet hardware is detected. When the computer is turned on the Apogee Duet will automatically power up and the Apogee Maestro software will automatically open. If it is not open, you can click on the program icon in the Dock , or simply restart the computer. The Apogee Maestro software will show you if the device is connected (red arrow pictured below) and also will show you the volume level on the mic 1 input channel. 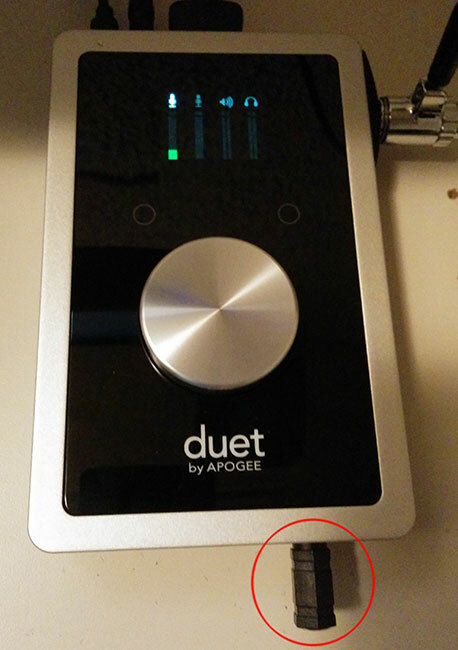 If the Duet 2 device does not appear on the left-hand side, either restart the computer, or unplug the USB cable on the back of the Apogee unit and re-insert it. Step 5: Now you can try using Audacity to record a simple voiceover. If you are hoping for a live headphone monitoring experience for your voiceover session, please set an appointment with a team member in the F&DM operations staff. This setup is rather complex using the Apogee Maestro software. NOTE: Because the Apogee Maestro software has all the necessary controls on it there is no need to adjust the buttons or control knob on the Apogee hardware device itself. If you would rather use the hardware button(s) to control the device, there is a comprehensive manual available. Click here for the manual for the Apogee Duet. Page 9 addresses adjusting the mic input or headphone input/output levels specifically.